The internal beta is already underway. Thousands of people are participating. Limited to Activision and selected partners. There will be no public beta! The PC version has every feature that the Xbox 360 and PS3 have. Ranked servers allow you to earn XP and COD Points. Max 18-24 players per server. Servers will run on top quality hardware and infrastructure with excellent bandwidth. There will be a ton of official servers at launch for everyone. Brand new server browser = no "console lobbies". COD7 is a Steam exclusive. Auto-updates via Steam, no manual patching required. No LAN mode + you need to be connected to the internet. VAC will be used as anti-cheat, no PunkBuster. Profile data is stored globally and accessible from anywhere on the internet. You earn COD Points, CP for short, by playing multiplayer matches and completing different challenges. CP is the games currency: use it to buy new weapons and upgrades. You can gamble your CP in Wager Matches for a bigger pay. One in the Chamber: You get a pistol, one bullet and 3 lives. You get one bullet for shooting or stabbing someone. Sticks and Stones: Arsenal includes a Crossbow, Ballistic Knife and Tomahawk. Kill someone with the Tomahawk to bankrupt that player. Gun Game: There are 20 weapon tiers, with one weapon per tier. You start with a pistol (tier 1) and with each weapon kill you go up one level + get a new weapon. If you get knifed at any point, you go back one level. Reach weapon tier 20 and you win. Sharpshooter: Everyone has the same random weapon for a fixed amount of time. With each kill you earn a Perk as a bonus. Pro Gambler: All game modes above. Over 300 emblems to choose from! Emblems have to be bought with CP, but some are unlocked after a certain level. 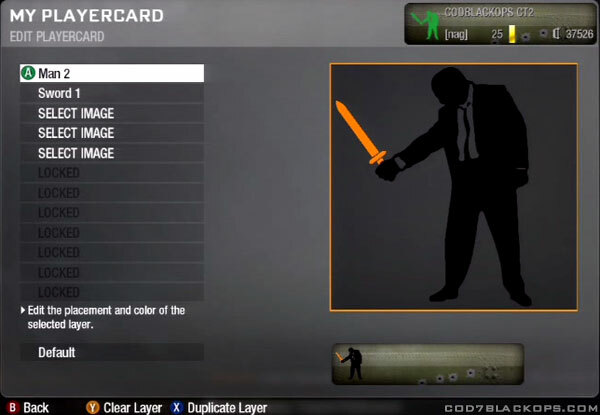 The emblems are customizable. For example, you can move, scale, rotate, color and stack them. You have 12 image layers available, but you don't have to use all of them. You can buy Contracts with CP. Completing a contract will earn you more CP than you paid for the contract itself. Contracts have different goals and time limits. Higher the difficulty, bigger the pay. Highest multiplayer level is 50. Prestige players can access the "Prestige playlists" where only the best of the best are playing.